Haba Shape Sorting Box "Animals at the Zoo"
The Haba Shape Sorting Box "Animals at the Zoo" provides your child with 人氣商品首選the utmost fun while sorting and sliding the colourful objects. 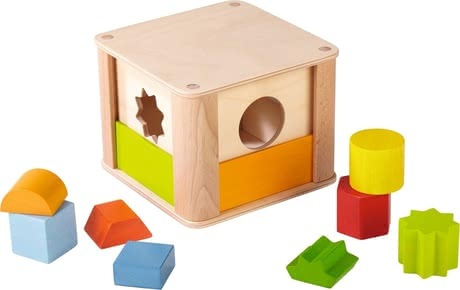 The tough wooden box comes with eight colourful wooden blocks in different shapes. The task is to sort the different shapes into their respective holes. Your child gets to know colours and shapes in a playful way while the cheerful animals stimulate your little one's fantasy. Absolute highlights are the coloured sliding plates that hide a hippo, a monkey or a cute crocodile. This sorting box makes your child learn new things in a playful way while stimulating their fine motor skills.